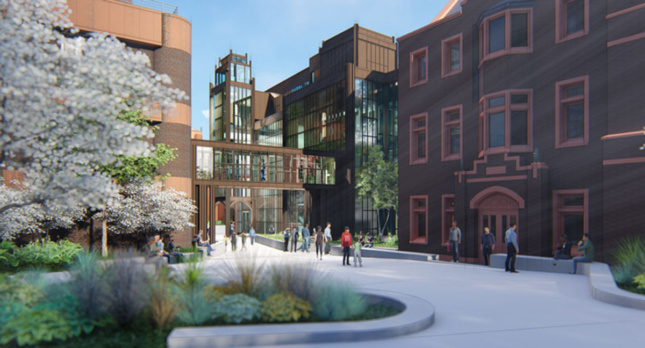 Yale University is slated to renovate and expand one of its oldest campus institutions, the Peabody Museum of Natural History on Science Hill. 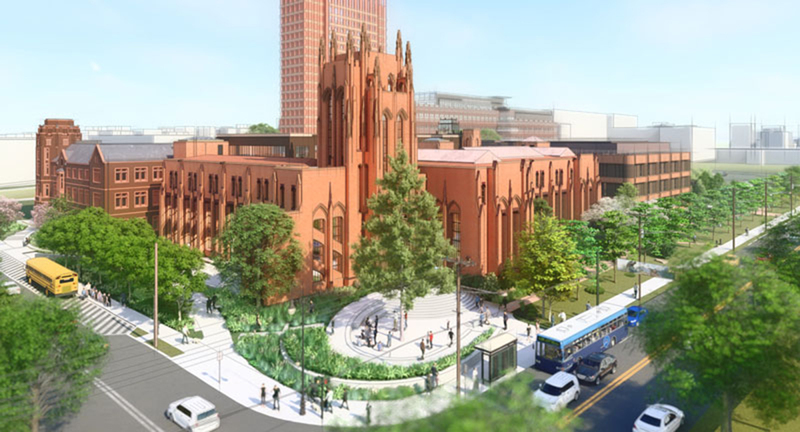 Thanks in part to a just-announced $160-million donation from philanthropist and Yale alumnus Edward P. Bass, the project will be the first major update the landmark museum has received in 93 years. The master plan, conceived by Centerbrook Architects and Planners, marks one of the boldest and most thoughtful endeavors the university has taken on in recent years. After well over a decade of planning, the project will yield 50 percent more exhibition space for the museum and improve storage for its on-site collection of over 13 million artifacts. It will also include the addition of a new, four-story infill structure that will connect the neighboring Environmental Science Center. The sky-lit, glass-enclosed connector will give students seamless access into the museum, where Centerbrook will create more modern spaces for research and study. One of Yale’s main goals for the addition, said Centerbrook’s principal Mark Simon, was to complement the timeless architecture of the original Peabody building, a three-story, French Gothic Revival, sandstone structure by renowned campus architect Charles Klauder. 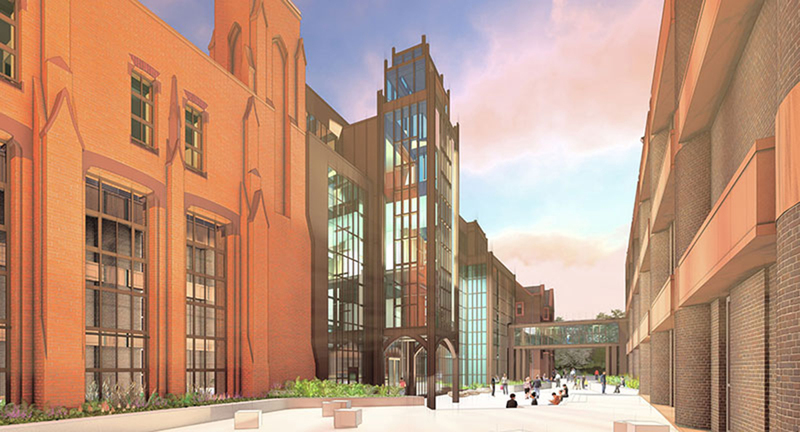 Using fritted glass and bronze-colored aluminum framing, the cathedral-like tower will bring a contemporary edge to the aged institution. The building out of the glass tower will be done in the initial phases of construction, Simon said. After that, the renovation of the museum’s existing spaces can begin. So far, a timeline for construction hasn’t been announced as Yale is currently strategizing on how to safely remove portions of the Peabody’s collection to a facility on its West Campus. Both the museum, as well as the other science buildings being updated during the project, will remain open throughout construction to students, faculty, and the 130,000 visitors—which includes 25,000 regional school children—who visit the Peabody each year. Other elements of the master plan include creating new classrooms, labs, and learning spaces for collections-based teaching and scientific exploration. The museum, founded in 1866, has been home to some of the most important discoveries in history and Yale hopes the renovation will help carry on the Peabody’s legacy of advancement in the industry. Centerbrook is one of Yale’s long-time partners. The local firm has completed 12 projects for the university from Kroon Hall, which they designed in collaboration with Hopkins Architects, to the Child Study Center, the renovated and expanded Reese Stadium—home of the men’s and women’s soccer and lacrosse programs—as well as an addition to the historic Yale Bowl.